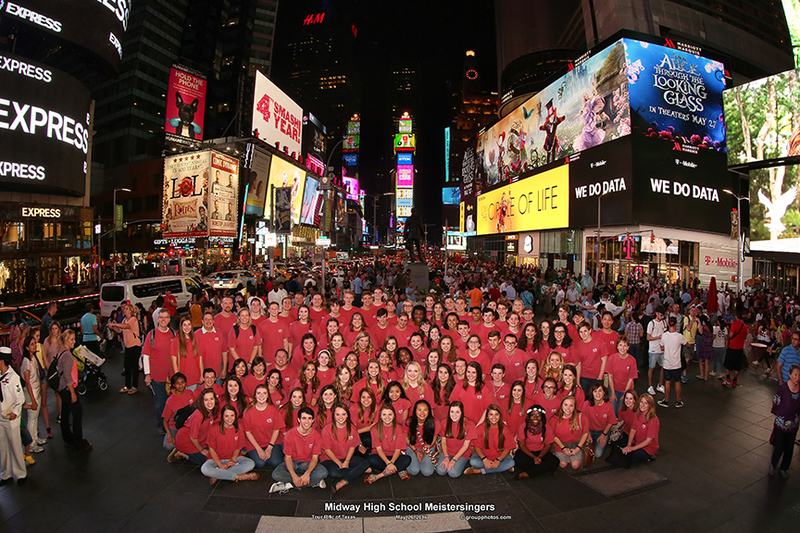 The Midway HS Meistersingers ventured to the Big Apple over the Memorial Day weekend. What a thrill for the group of 80 MHS juniors and seniors, accompanied by 15 parents and 2 directors, to experience one of the most famous cities in the world. The trip began before dawn on a Thursday morning as the group made their way to Dallas Love Field via charter bus. Arriving in NYC before noon allowed the group to take in the sights of Time Square and grab lunch at a local restaurant or food truck. The first evening of the trip included dinner at Cucina’s in Rockefeller Plaza, a trip to the top of Rockefeller Center (Top-O-the Rock), and a group photo opp in Times Square followed by an impromptu performance by the choir. All the while, the students and parents were taking in the sights like Radio City Music Hall and the Empire State Building. The second day included a city tour in two groups aboard charter buses with official NYC tour guides. Chinatown and Central Park were two of the highlights of the morning. Another impromptu performance opportunity was found in the tunnel at Bethesda Fountain in Central Park. Later that evening, we had dinner at Guy’s American Kitchen at Times Square followed by An American in Paris at the Palace Theater. As we had done the day before, all our trips around the city (except the city tour) was via subway. What an adventure to ride the subway with 97 friends! The third day of the trip, Saturday, we rose early and rode the subway to Battery Park where we boarded a ferry to Ellis Island and the Statue of Liberty. What a moving experience to be in the building where immigrants once first set foot in America. The weather was clear and beautiful for great photos of the Statue of Liberty up close. After Ellis Island we walked en masse up Broadway to Zucotti Park for lunch at food trucks and local restaurants. After lunch we walked to the World Trade Center Memorial and Museum just across the street from the park. This experience was the most surreal experience one could imagine as we viewed the victim’s names and the water falling into the pools in the footprint of the twin towers. The museum experience was overwhelming with the amount of videos, photos, and displays of artifacts from the September 11, 2001. After the WTC experience, we boarded the subway for the trip back to the hotel for a quick break before dinner and another show. That evening dinner was at Bubba Gump’s Shrimp in Times Square followed by Aladdin at the New Amsterdam Theater. The show was mind-blowing with its upbeat and familiar music, incredible actors/singers, sets, costumes, and incredible technical feats. We were all wide-eyed and wishing for more. Our final morning in New York City was spent packing our bags, loading the buses for the transfer to LaGuardia for our flight home. However, we had one more performance opportunity at St. Bartholomew’s Church at Park Ave. and 51st Street. This wonderful congregation has allowed several Midway HS Meistersinger groups to perform a brief concert as a prelude to their Sunday morning service. This was a wonderful opportunity to perform our music in a beautiful, historic setting. Those in attendance enjoyed the performance very much. Our flight home was in two groups, one with a layover in St. Louis and the other in Kansas City. After some weather delays we made to Dallas around 11:00 pm and home to MHS at 1:10 am. What a wonderful trip!